Jerome’s keynotes are delivered with wit and passion. Heavily peppered with humor, Jerome makes the serious topics of fraud, ethics and prison easy to digest. He is considered to be a seriously humorous public speaker. This keynote presentation primarily deals with fraud and ethics, but the story revolves around his family and friends and how they had to cope with the embarrassment and shame of being connected with someone who committed a crime, conspiracy to commit mail fraud, conspiracy to commit wire fraud and money laundering. This is a serious story but delivered by Jerome, a funny speaker. Jerome talks about what signs he saw or should have seen. 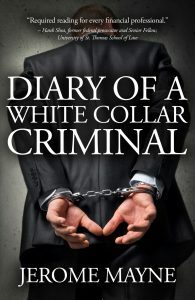 Watch as Jerome delivers the observations of the behaviors of his, would-be, white collar crime co-conspirators. How does prison change your life? Jerome talks about how his life changes as soon as the indictment came out in the newspapers. Jerome talks about what signs he saw or should have seen. Watch as Jerome delivers the observations of the behaviors of his, would-be, white collar crime co-conspirators. The story revolves around his family and friends and how they had to cope with the embarrassment and shame of being connected with someone who committed a crime, conspiracy to commit mail fraud, conspiracy to commit wire fraud and money laundering. Ten months of pretrial. Slowly loosing touch with family and friends. Packing up your personal belongings, not to bring with you, but to store them… somewhere? As the days of freedom wind down, you become judicious about things like toiletries. Why buy a new bottle of shampoo with only 10 days out from reporting to prison? It’s amazing how trivial little things become so important. Or, perhaps it’s just a way to distract yourself from the impending doom of your first day in prison.